The Gabriel's brickworks was on Hoe Lane, Enfield Wash, London & specialised in red hand made bricks from the early 1930's to 1976. Info & Photo by Martyn Fretwell. 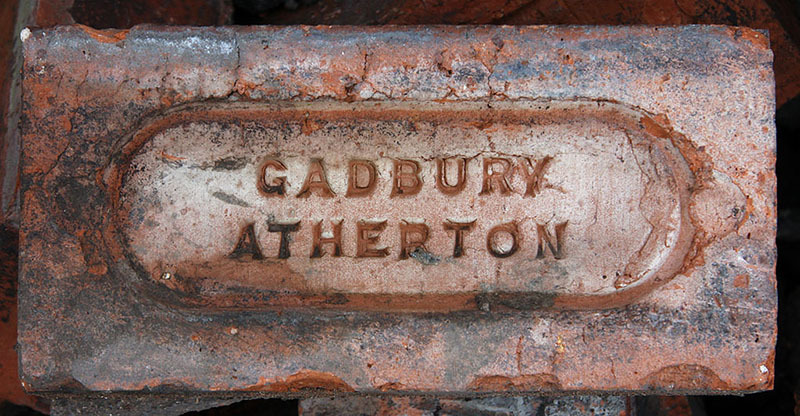 Gadbury brickworks, on the south side of Wigan Road from Gibfield Colliery, was named after the old Gadbury Fold Farm nearby. It was established by Fletcher Burrows and Co, owners of Atherton Collieries around 1914. The works closed around 1964 shortly after the colliery finished working. Photos and info by David Kitching. William Gale, Hainault Road, Romford, Essex is listed in Kellys 1890 to 1937 editions (last available). William was also in partnership with George Gale at a works in South Woodford, which is listed in Kellys 1886 to 1925 editions. George is also listed at the Romford works with William from Kellys 1902 edition. Photo & Info by Martyn Fretwell. Charles Corden of 21, Wilford Street, Nottingham carrying on the business at Gallows Inn Brickworks, Ilkeston as brick & tile maker filed for liquidation on 24th May 1880 at Nottingham Crown Court. His brickworks is recorded on an 1884 map showing it was north of Nottingham Road between the River Erewash & the Erewash Canal, with the Gallows Inn public house to the south. This area of Ilkeston is so called after its association with the site of the towns gallows. Photo & Info by Martyn Fretwell. The Gally Hill Brickworks, Coxheath Road, Church Crookham, Hants is shown on the 1894 OS map. The 1909 map records this works as the Old Brick Works, today Woodland Rise occupies this former brickworks site. Also on the 1909 map a new brickworks is shown as the Crookham Brickworks, next to the Basingstoke Canal. There are no entries for D & M, Gally Hill in the trade directories that have so far been investigated. Photos & Info by Martyn Fretwell. Thanks to Darren Haywood for the contribution. Found in the Clayton area of east Manchester by Ian Miller. Photo by courtesy of the Colin Driver collection. Three West Yorkshire products from the same company. Photos by courtesy of the Frank Lawson collection. Photographed in a property in Thornhill, West Yorkshire by James Lupton. Found in a park near Bramhope, Leeds by Mark Harriman. Made by John Garland & Son, Cherry Row, Leeds, listed in White's directories of 1861 and 1870 - a date compatible with the style of lettering. Thanks to Phillip Rothery for the history. Found at North Shropshire Recycling yard by Martyn Fretwell. Made in Birmingham. Martyn adds: John Garlick is recorded as living at Shaw Hill House, Upper Saltley in 1881, with his clay pits & brickworks nearby. He used his depot at Worcester Wharf on the Birmingham & Worcester Canal to transport his bricks via the canal network. He also owned another brickworks in California using the Dudley No.2 Canal. John employed around 700 men at his brickworks before his business went bankrupt in 1884. Photographed at Four Oaks Reclamation Yard by Martyn Fretwell. 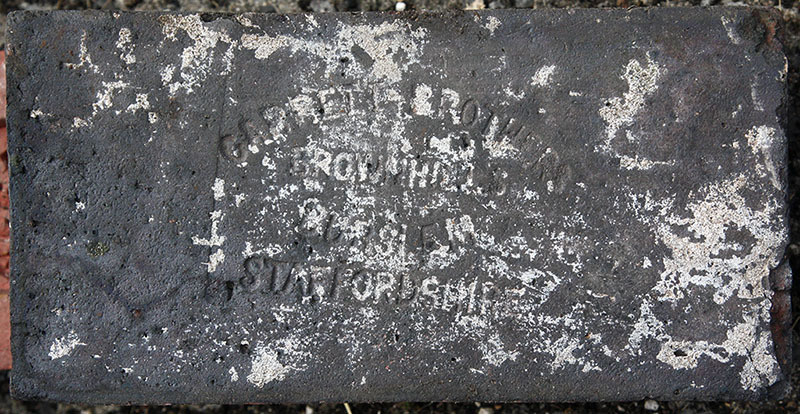 This paving brick is a product of Garrett Brothers who traded from their Brownhills Tileries in Tunstall and appear in the trade directories between 1861 and 1865. Worrall's Wigan & District Directory of 1881 lists William & David Garton as brickmakers at Bank Heath, Golborne. Info from Frank Lawson. Joseph Gascoyne & Son is recorded in Whites Directory for 1857 as Builders, Brick & Tile Makers at 22, St Peters Street (Offices) & Uttoxeter Old Road (Works). Photo & Info by Martyn Fretwell. 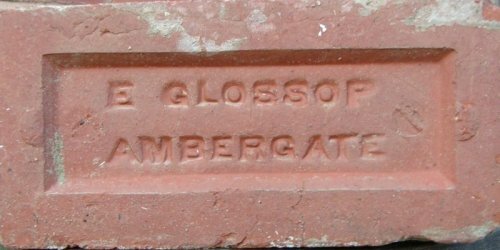 A little known concern to myself, this brick of the Gateshead Brick & Stone Company, was recovered during internal alterations to a local property, built c.1880. Davison (Brickworks of the North East, 1986) mentions them is passing, with a date of 1925 - this usually refers to a directory entry. The only other reference I've been able to find is from 1955 and a notice of the Company's liquidation. As to their location, or whether they actually manufactured their own products, (it has to be said of very poor quality), or acted as a factor or agent, more work is obviously required. 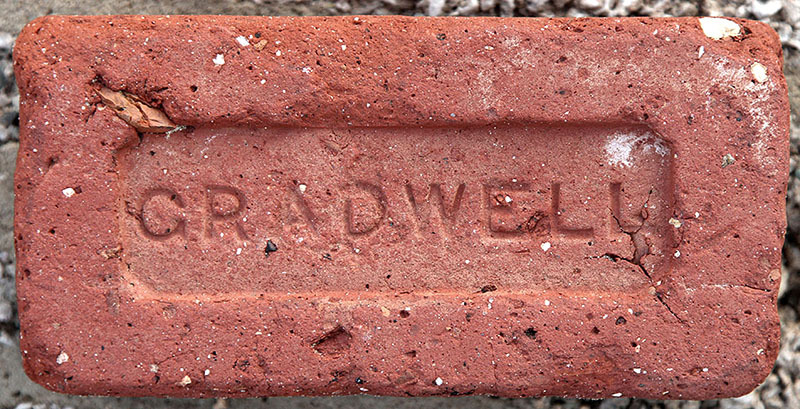 As an aside, the facing bricks of the property in question are a fine off-white and were produced at Axwell Park Colliery (APC) - could this be a subsidiary used to market these heavily 'grogged' bricks and the stone by-product of mining operations? Photo and info by Arthur Brickman. 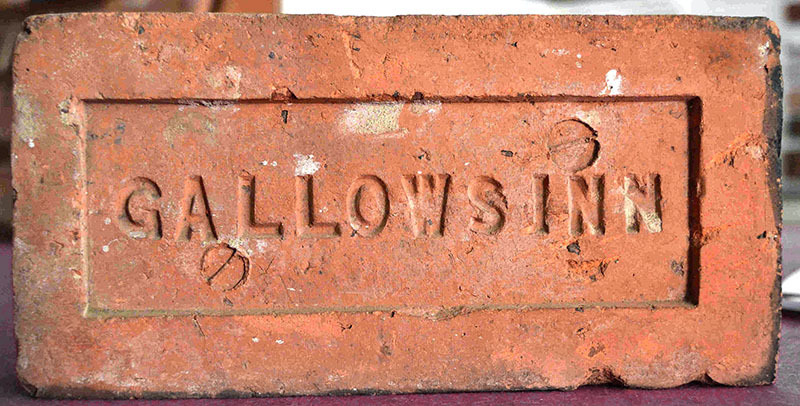 Gault bricks are a type of brick mainly made in Suffolk & Kent & I have found that maker Plowman Brothers of Gamlingay near Sandy are listed as producing Gault bricks in Kelly's 1904 Cambridgeshire edition, so they could be the makers of this brick. Photo & Info by Martyn Fretwell. Photo by courtesy of the Richard Symonds collection. Martyn Fretwell writes :- Mark Gentry is listed as the owner of the Sible Hedingham Brick & Tile Works, Sible Hedingham, Halstead, Essex in Kelly's 1894, 1902 & 1914 editions. His bricks were used to build the 'Five Star' Mayfair Hotel in London & where produced at his two brickworks. The Langthorne Works was on Wethersfield Road & the Highfields Works was near Purls Hill. Photos by Alwyn Sparrow. 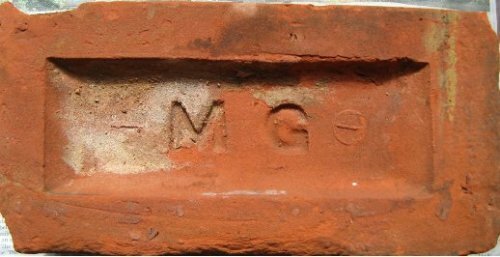 Front and side of a Mark Gentry brick. 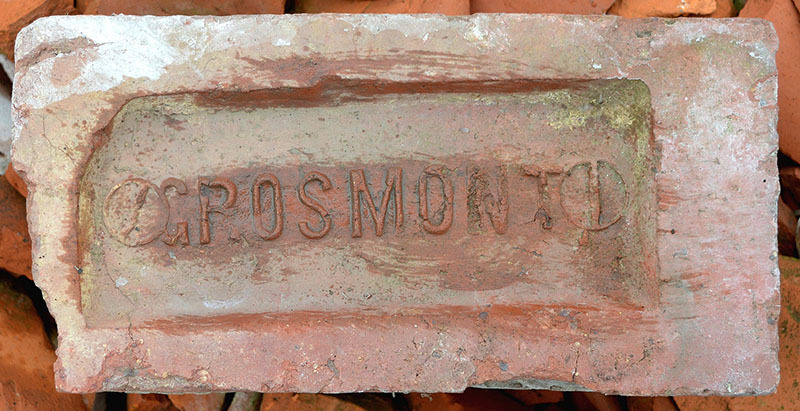 Martyn Fretwell believes that S M is the brickmakers initials and they were made for the LMS Railway. Found in Garforth, West Yorkshire. 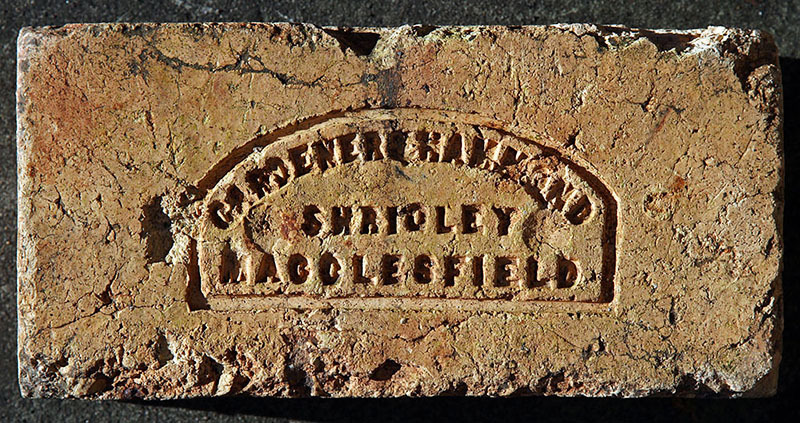 This expertly and boldly lettered brick was made by George Backhouse Marshall & Sons, Church Garforth, listed as masons, builders and brickmakers in White's Clothing District directory, 1875. Image PRBCO. Diazite was a trade mark of General Refractories, a company that had its head office in Sheffield. 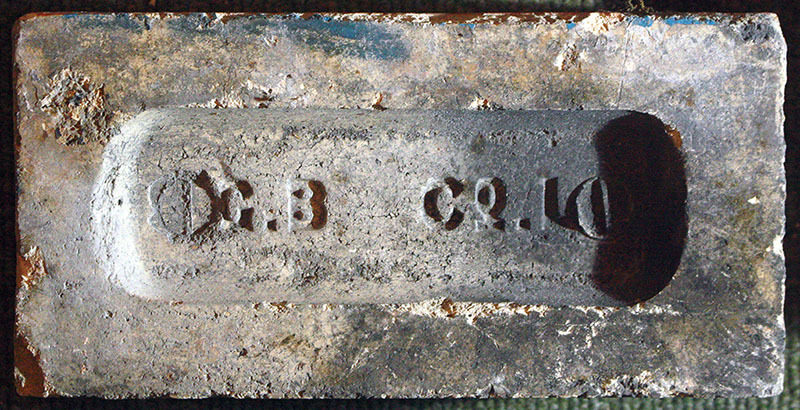 This refractory brick was found by Frank Lawson on the banks of the River Humber close to the Capper Pass works at North Ferriby. Info by Mark Cranston. Photographed at Cadeby Reclamation yard by Martyn Fretwell who writes: I have just found in Kelly's 1891, a E. Gent, brickmaker, Donisthorpe, Ashby de la Zouch. Is the brick misspelt or the Trade Directory ? The brick was photographed not to far from Ashby. Gibbons (Dudley) Ltd, No. 1 Fireclay, thanks to Ken Perkins for the contribution. Photo taken in Ewenny by Richard Paterson. Martyn Fretwell writes :- From the Fireclay listings in Kelly's, B. Gibbons, Jnr. 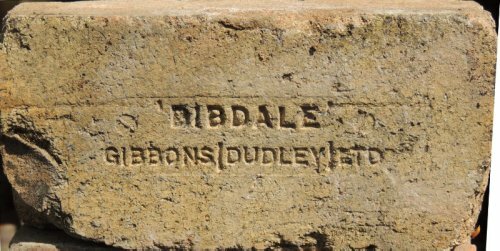 is listed at Waddams Pool & Lower Gornal in it's 1896 edition & then from 1921 to it's 1940 edition as Gibbons (Dudley) Ltd, Dibdale Works, Dudley. Then in Kelly's Brick & Tile listings the entry is B. Gibbons Jnr. & Co. Deepdale Works, Lower Gonal, Dudley, 1860 to 1912 editions. Photo by Colin Wooldridge from the John Cooksey Collection. Photographed at the Black Country Living Museum by Martyn Fretwell. 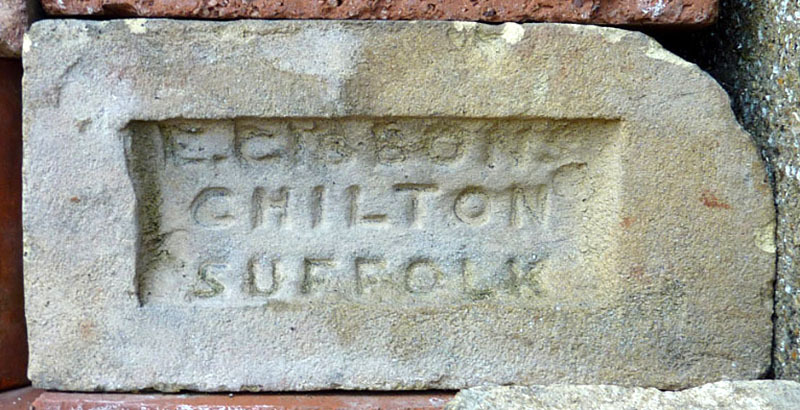 Kelly's 1869 edition records Edward Gibbons at the Wolsey Street works, Ipswich & the Alexandra brickyard in Chilton, Suffolk. Then the 1875 edition records Edward Gibbons & Edward Charles Gibbons at the two works. Kelly's 1879 sees the addition of a third works at Aldham, Hadleigh. Then the 1888 to 1900 editions just lists Edward Charles Gibbons & owning five works including Chilton. The 1912 & 1916 editions now records Mrs. Mary Price Gibbons as the owner of the Chilton works. The other works previously owned by E.C. Gibbons are no longer listed. Photo & Info by Martyn Fretwell. Report from the London Gazette dated 31st January 1911, that the partnership of William John Gibbs, Alfred Rendell Gibbs & Horace Rendell Gibbs, known as Gibbs Brothers, Brick & Tile Manufacturers & Building Merchants of Loughborough has been dissolved. 31st January 1911. Any debts due or owing by the said late firm will be received by William & Horace Gibbs, who are to carry on the same business under the same name of Gibbs Brothers. Photos and info by Martyn Fretwell. G. Gilbert is listed in Kellys 1849 & 1850 editions at King Street (residence), Walsall. Also found three more brickmakers with the surname of Gilbert in these directories & I expect they were related. 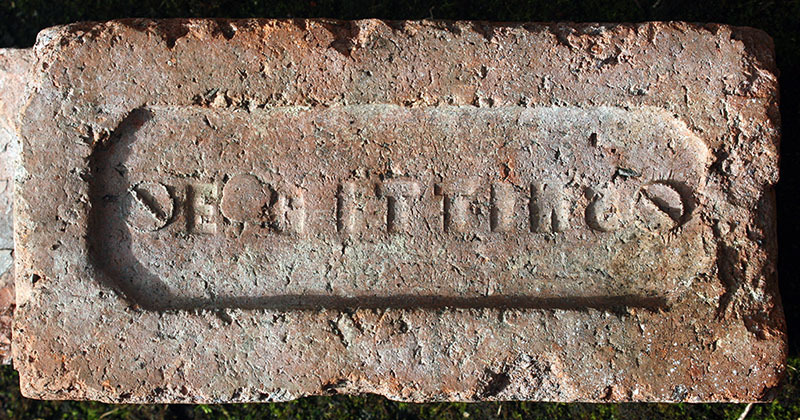 Elias & John where at Greenhill, Litchfield & William is listed as making blue bricks at Dudley Port & Tividale, Dudley. Info & Photographed at Four Oaks Reclamation Yard by Martyn Fretwell. 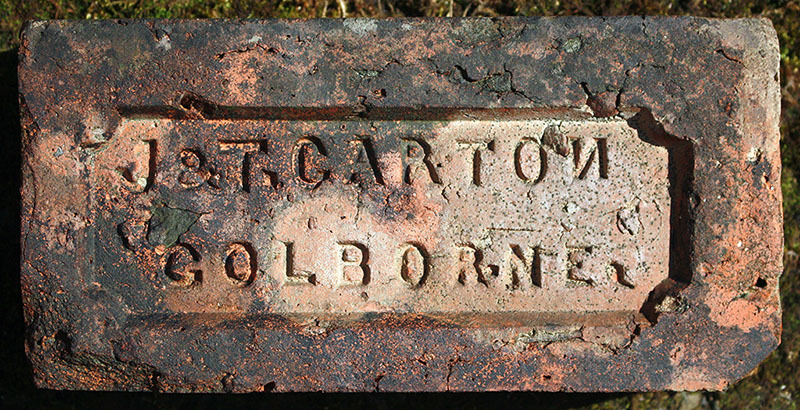 With photographing this brick at Ludlow Resource Centre I expect W. Gilbert was a local maker. I have found that there where four brickworks in Ludlow, two where next door to one another on Fishmore Road & the other two where either side of the railway line next to the towns railway station. Info & Photo by Martyn Fretwell courtesy of Shropshire Museums. The Gildenburgh Brick Co. is listed in Kelly's 1906 & 1910 editions at 52, Narrow Bridge Street, Peterborough, (office). The works was situated on New Road in Whittlesey & was owned by LBC when it closed in 1945. Today the clay pit which has filled with water & in places is 70 ft. deep is the Gildenburgh Dive Centre. Info & Photo by Martyn Fretwell. Photos courtesy of the Bill Richardson collection at Southwick Hall by Martyn Fretwell. The Post Office Directory of Cumberland & Westmorland 1873: - Firebrick Manufacturers, Mrs Mary Lucock, Gillhead, Flimby & Broughton Moor, Maryport. 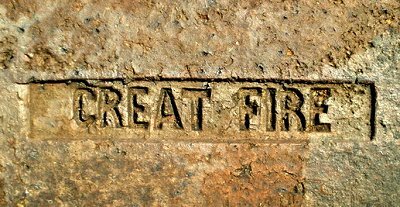 Kelly's Directory of Cumberland 1894: - Firebrick Manufacturers: Cumberland Coal & Brick Syndicate Ltd., Graves Road, Gill Head, Flimby, Maryport. Found by David Ashford in Maryport.. 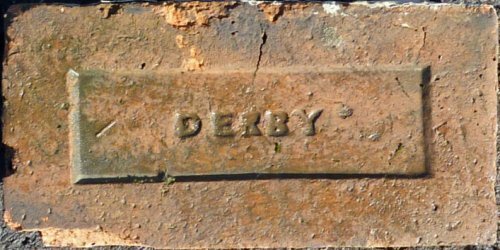 The reverse of this brick is lightly stamped Stanton & T. Gillott is recorded as brickmaker in Stanton By Dale, Derby in Kelly's 1855 edition. Photo & Info by Martyn Fretwell. Could have been made by William Hall who is listed as brickmaker at Gilt Hill, Kimberley in Kelly's 1885 edition. Another option is nearby Digby Colliery Brickworks which was also known locally as Giltbrook Colliery, but bricks found so far made by this colliery have been stamped Digby. 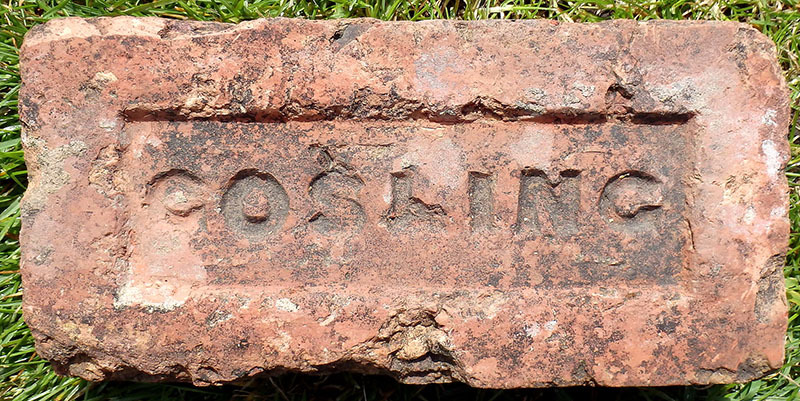 I have given this second option because this brick is in the collection of pit bricks at Pleasley Mining Museum. Photo & Info by Martyn Fretwell. Found near Blisworth by Nigel Furniss. Edward Gittins, Wakefield Road, Bowling, Bradford. The Bradford 1856 directory records that Edward Gittins had arrived from Leicester and was advertising his new patent-brick works at the junction of Wakefield Road and New Hey Road. Info from Derek Barker at Bradford Local Studies. Thanks to John Biggs for the photo. John understands the works was on the Wells road and is now the site of St. Dunstands School. Photo by Martyn Fretwell, found in Sutton in Ashfield. 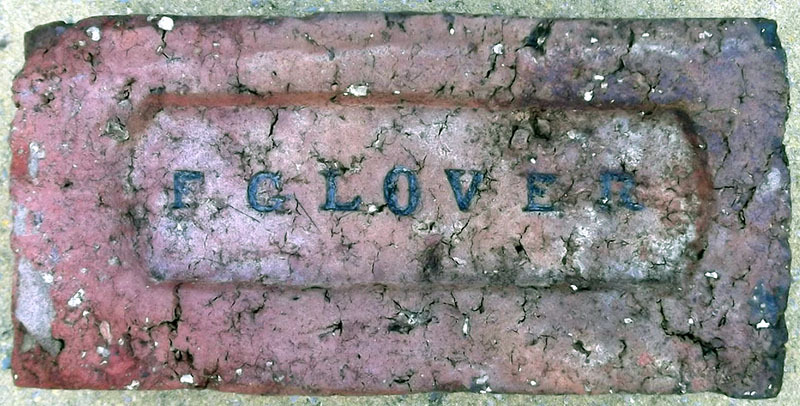 With this brick saying Late Bond, it seems to infer that John Bond, it's owner has passed away, but I have now found out that John Bond sold his Globe Brick Works to a newly formed consortium of local businessmen around 1875, who then named their new company the Globe Brick Co. 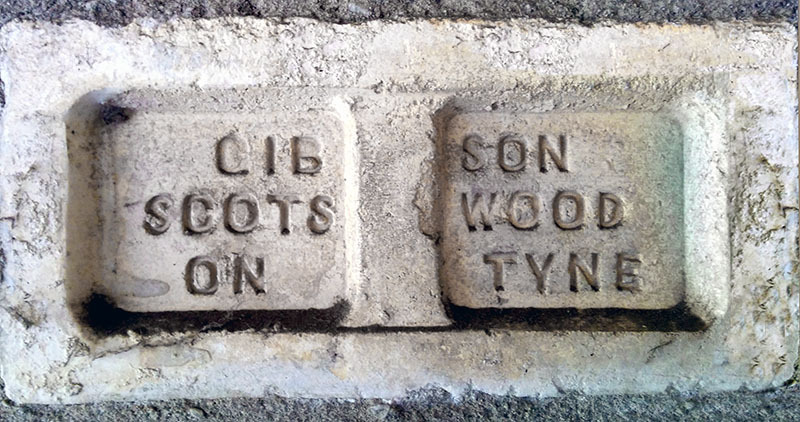 Hence the Late Bond on the brick referring to the Works being previously owned by John Bond. Bond continued to run his two other brickworks until 1905. 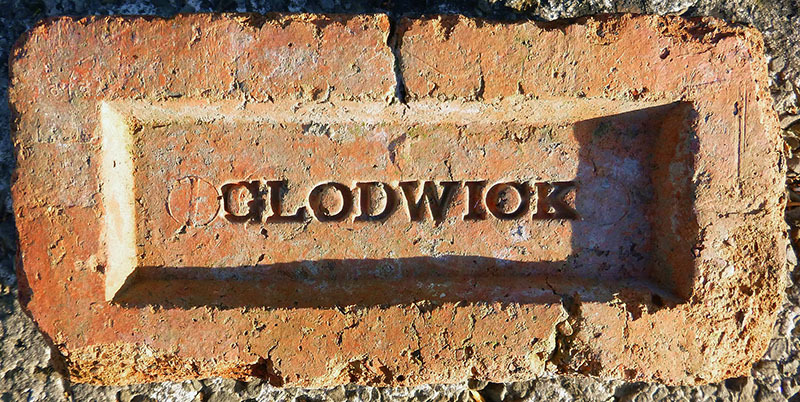 The Globe Brick Co. consortium included Edward Townley, W.R. Willis, Walter Dauncey & R.C. Wright & at a later date A.H. & F. S. Stephenson. The Globe Brick Co. on Garrison Lane is recorded in Kelly's 1878 edition with Walter Dauncey as Manager, then in 1879 to 1890 editions Walter Dauncey is recorded as Manager/Partner. From 1892 to 1915 editions we then find Albert Henry Stevenson listed as Manager. The Globe Brickworks closed in 1931. Info & Photographed at North Shropshire Reclamation Yard by Martyn Fretwell. Photographed at Four Oaks Rec. Yard by Martyn Fretwell. Found near New Hey, Lancs by Frank Lawson - Glodwick is a suburb of Oldham and is in the vicinity of the Lowside brickworks. 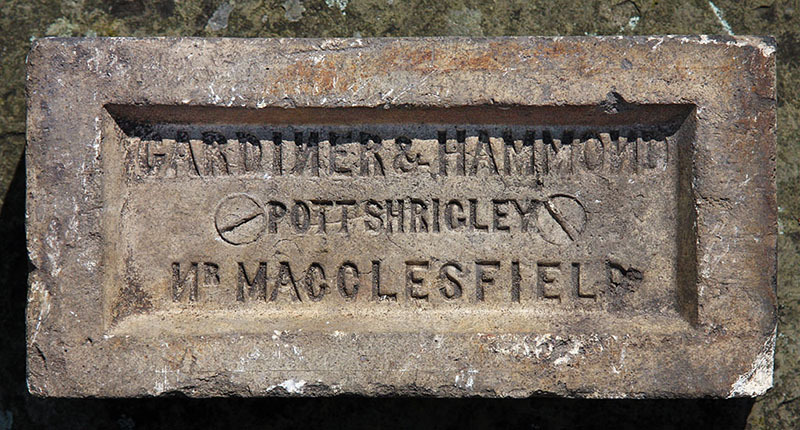 Found on Besom Hill near Oldham,itself a site of several brickworks at one time. Photo by Colin Driver. Spotted in Riddings, Derbyshire by Martyn Fretwell. Found in Darley Bridge, Derbyshire by Simon Patterson. 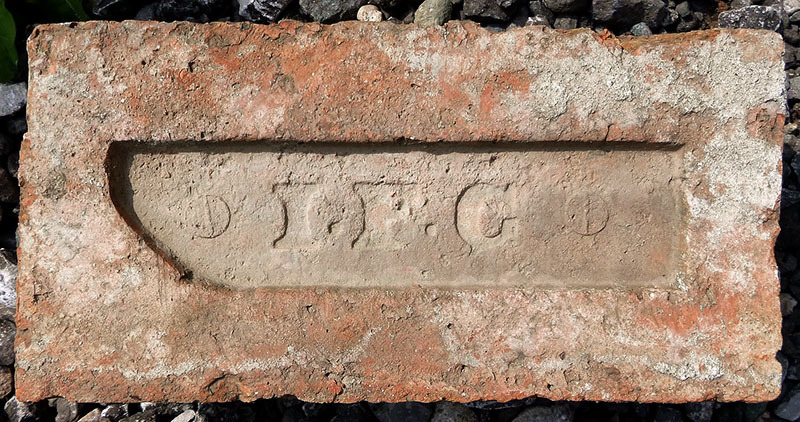 The Hanford brickworks of Sarah Glover operated from at least 1851 until 1871 and it appears from this brick that her daughter Emily Shelly Glover took over at some point after that date. Emily married William Adams Peake and by 1881 he was running the works in his name as the Hanford Tileries. Photo and info by David Kitching. Frank Glover operated a brickworks behind Ryehill Farm in Miles Green, Audley, Staffordshire. He is recorded as a brick maker from 1865 until 1886 and is only listed in the trade directories between 1876 and 1884. The brickworks was on land owned by Daniel Booth. In 1881 Glover is recorded as a farmer of 14 acres and brick maker living at Queen Street which is just to the west of the brickworks. Photo by Ken Perkins. Godstone brickworks, Surrey. Photos by courtesy of the Richard Symonds collection. 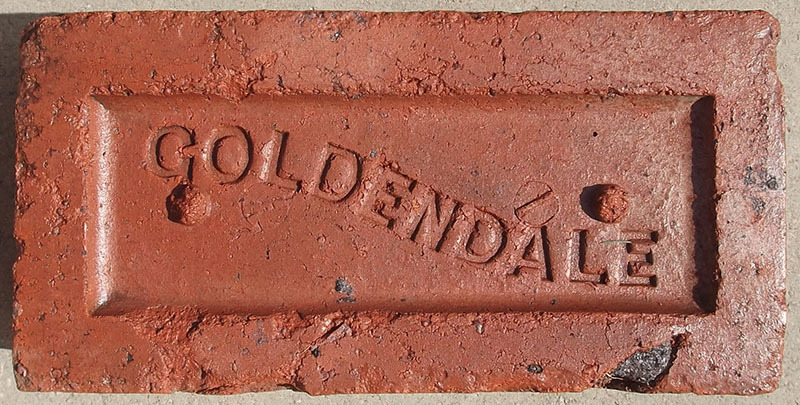 The Goldendale Brick & Tile Co, Tunstall, is only listed in the 1904 Kelly's directory and the works had a short life. Photo and information by David Kitching. George Goodall is listed in Kelly's 1878 & 1883 editions as brickmaker at Anthony Road, Upper Saltley, Birmingham. Info & Photo by Martyn Fretwell courtesy of the Chris Thorburn Collection. Francis Harry Gordon opened his brickworks in the 1870s, on a site with a 30ft thick bed of clay, adjacent to the Daw End Canal just south-west of Clayhanger Bridge at Brownhills. The buildings included three drying sheds, the largest measuring 150ft x 30ft and had a cast iron plated floor. Nearby and on the other side of the canal was the Walsall Wood Colliery brickworks and price cutting by this works led to the demise of the Gordon business in 1896. Photo and information by David Kitching. Found in Station Road, Killamarsh by Malcolm Adlington. Found near Alfreton by Frank Lawson. John Hall Gosling is recorded as owning collieries in the Chesterfield & Barlborough areas in the mid 19th century. He is recorded in Kelly's from 1864 to 1881 & then in the Barlborough P.O. Directory for 1885. In Kelly's 1887 & 1891 editions he is followed by Fredrick Gosling as brickmaker at Barlborough, possibly his son or brother. Info & Photo by Martyn Fretwell from the Phil Sparham Collection. Photo by Ray Martin, made in Birmingham. Wiliam Gradwell was a major building contractor in Barrow-in-Furness. In 1855 he moved his business to Hindpool, Barrow, and set up a brickworks in Dalton Road capable of turning out 75,000 bricks a week. Photo and info by David Kitching. Found in Barrow in Furness by Richard Cornish. J. Graham & Co., Blaydon Haugh, Gateshead, Co. Durham A business situated in close proximity to the more famous William Harriman at Blaydon Haugh, the firm of John Graham & Co. appears only once in local directories around 1875. The origins of the company therefore remain obscure, although William's niece would appear to have married a Graham, so maybe there is a connection through marriage? Information provided by "Scottish Brick History". Photo by Frank Lawson. 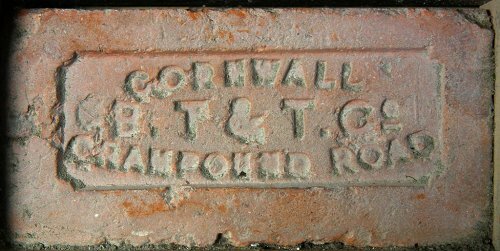 All made at Grampound Road Brick & Tile Co 2 SW916512 & SW920514. Photos by David Kitching, part of the collection at Wheal Martyn China Clay Museum. 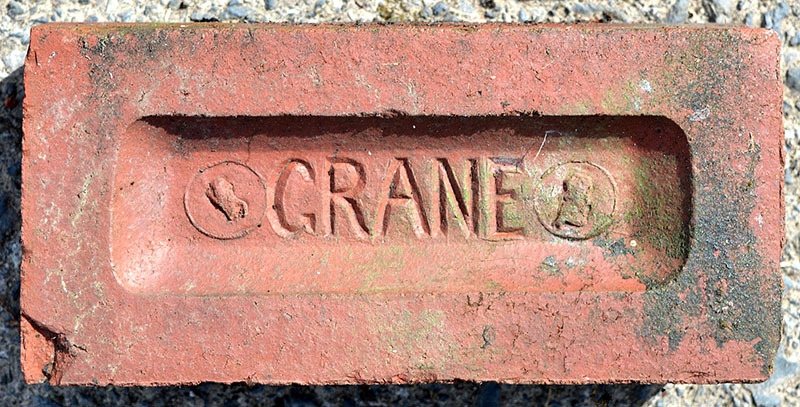 Made in Haslingden, Lancashire by the Grane Brick & Terracota Works. Photo by courtesy of the Frank Lawson collection. Photo by courtesy of Colin Driver. Henry Graves, Gillhead Brickworks, Flimby, Cumbria. In 1867 a colliery was sunk at Gill Head, Flimby by Messrs Lucock & Carlton to produce coal, fireclay and gannister. The Whitehaven News for 18th January 1872 carries an advert "Gillhead Colliery and Brickworks for sale, apply Mrs. Lucock, Broughton Moor". Again, in January 1876, "FOR SALE by private treaty; Gillhead Colliery and Brickworks near Flimby, in use by representatives of the late Mr. Joseph Lucock". 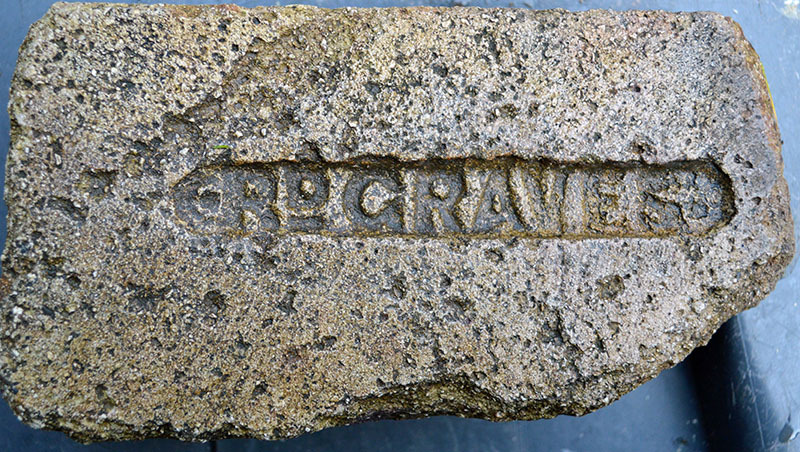 In 1878 a partnership between Mary Lucock and Henry Graves, as Coal Owners and Brick and Tile Manufacturers, at Gill Head, in the parish of Flimby, was dissolved with Henry Graves continuing the business in his own name. The business became the Gillhead Coal & Firebrick Co. in 1897. Photo and info by David Kitching. 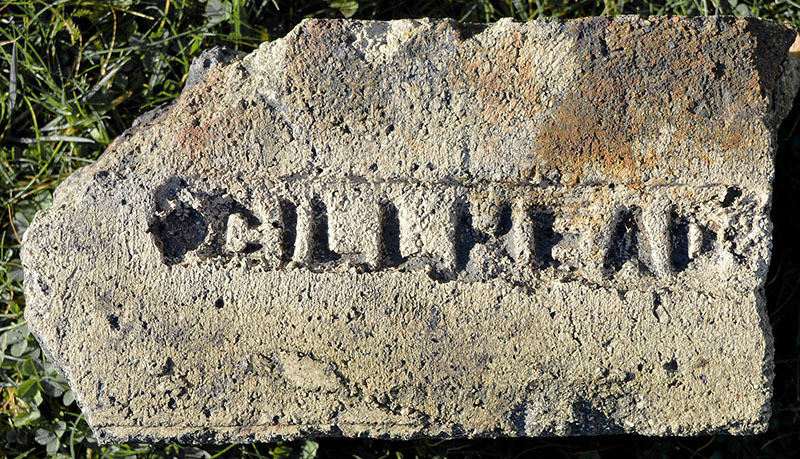 proprietor and firebrick manufacturer, Gillhead. Image and info from Richard Cornish. Operating around 1875 Gray & Son's works was on Newmarket Road, Cambridge. Info and photo by Martyn Fretwell. Grays Chalk & Quarries Co. Limited, Grays, Essex are listed as brickmakers in Kellys 1874 to 1910 editions. Photo & Info by Martyn Fretwell. 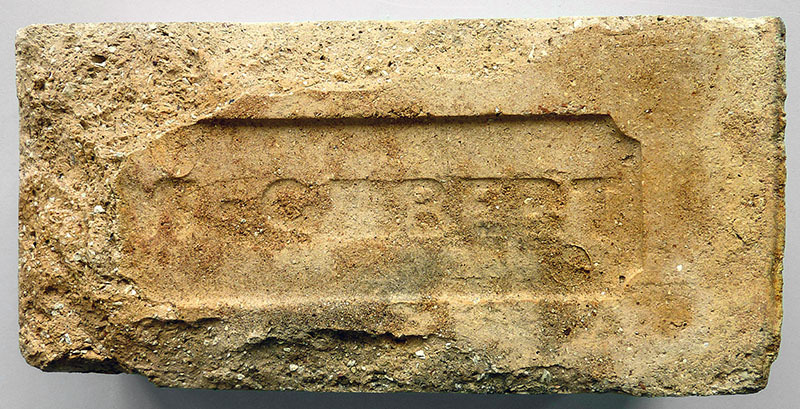 Great Fire is one of a collection of 50 British fire bricks found in the St Petersburg area by Vladimir N Smirnov. His British collection may be viewed here, the text is in Russian. 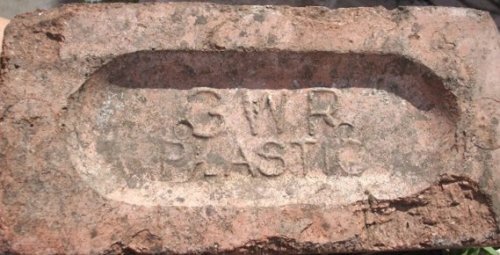 A Great Western Railway brick. Photo by Simon Patterson who spotted it in Slapton, Devon. Photo taken by Jo Roesen at Broadway station Worcs, read the blog here. Great Western Railway/Southern Railway. Photo by Phil Jenkins. George Green is listed as brickmaker at Mapperley, Nottingham in White's 1864 Notts. edition. Info & Photographed in Awsworth by Frank Lawson. Found at Spofforth Haggs, North Yorkshire. 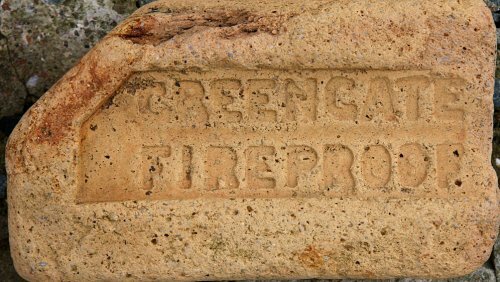 Joseph William Green is listed in directories from 1871 to 1927 and it appears that the principal brick works was at Roecliffe near Boroughbridge. Other sites listed are at Aldborough, Pilmoor, Stonefall, Moor Monkton and Langthorpe. Image PRBCO. Found in Oldham and is likely to be Bent Grange Brick Works, Lewis St, Oldham. 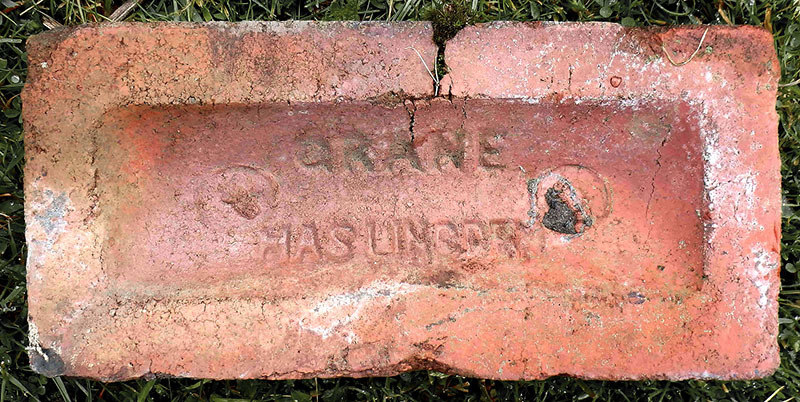 He is recorded in 1881 as a Master Brickmaker employing 3 men and 2 boys. The business is recorded in trade directories from 1875 to 1889. Found by George in Co. Durham. 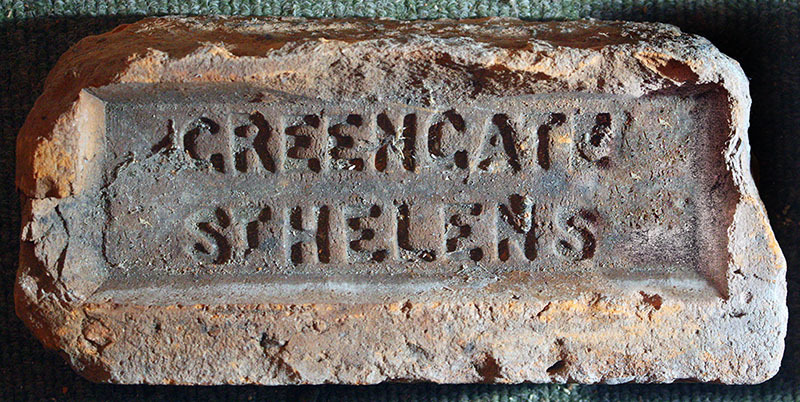 The Greengate Brick and Tile Co., also owned Greengate Colliery at St Helens. Later the brickworks passed to Pilkington's. It was situated close to the railway on land at the rear of the current Pilkington's Greengate factory. Photo and info by David Kitching. Greenhill Brickworks near Chilsworthy SX420717. Photo by David Kitching, part of the collection at Wheal Martyn China Clay Museum. 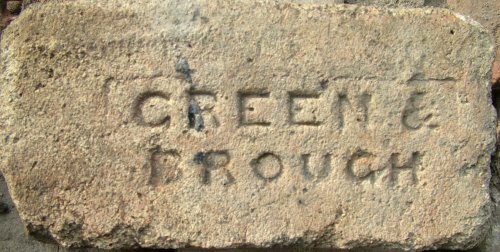 Rand Sherwell Greenough, Brick manufacturer, Builder & Corn & Coal Merchant, Northampton. A large complex of workings to the east of Kingsthorpe Road, around Freehold Street has been in existence at least from 1847, with at least one kiln. By 1883 there were at least nine kilns with a multiplicity of owners and at least two owners here. In 1866 John Clarke was advertising the making of bricks by 'steam'. In 1877 John Wills was also advertising a 'steam brickworks', (see entry for WILLS ). In 1894 Greenough and Henry Martin were the owners, until Martin's place being taken by A. J. Chown by 1910. Shortly after this date the works closed. Photo and info by Nigel Furniss. Made in West Sussex, photo by Alan Davies. Both found in Penistone, Yorkshire by Frank Lawson. William James Greenwood, Westend House, Woodhouse, Sheffield. White's Sheffield & Rotherham Directory 1879/1901/1905/1908. The brickworks was situated on Bishop Hill (off Sheffield Road), Woodhouse. Photo and info by courtesy of the Frank Lawson collection. Probably made at the Sarn works. Photo by Mike Shaw. Photo by Darrell Prest. In the 1881 Kelly's Directory of Halifax the executors of 'George Greenwood' are brick-making at New Bank. By the time of the 1908 Trade Directory there is George Greenwood & Sons, Builders Merchants, of New Brunswick Street, Halifax. This company came to own: Beacon Hill Brick Works (formerly Oates & Green) and Swan Bank colliery and brickworks, together with several quarries. They were still active in the mid-1930s. Thanks to Derek Barker for the information. Found near Guiseley by Frank Lawson. Thanks to Simon Patterson for the photo. 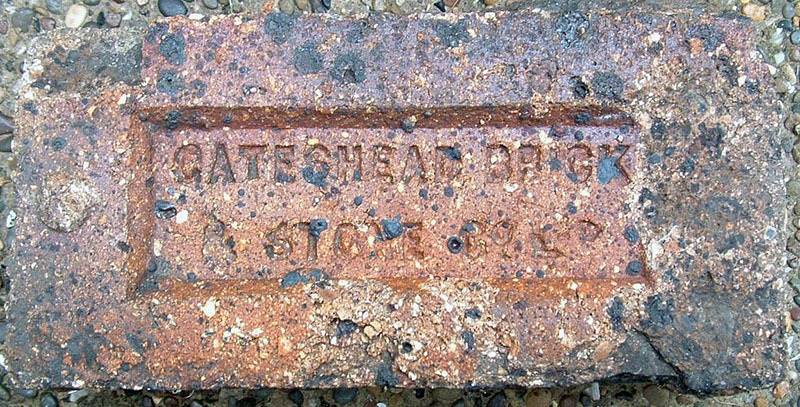 Michael Hammett has supplied some info on this brick: This was more than likely made by J. Gregory & Sons Ltd, Ecclesall brickworks, Ecclesall road, Sheffield, Yorkshire - I have no record of exact period during which this firm was in operation, but it was established by 1877 and was closed by 1943.
photo courtesy of Graham Hague (Sheffield) collection. Correct spelling is Griffydam and it's in Leicestershire, only reference is that there was a brickworks in the village. Photo by Martyn Fretwell. 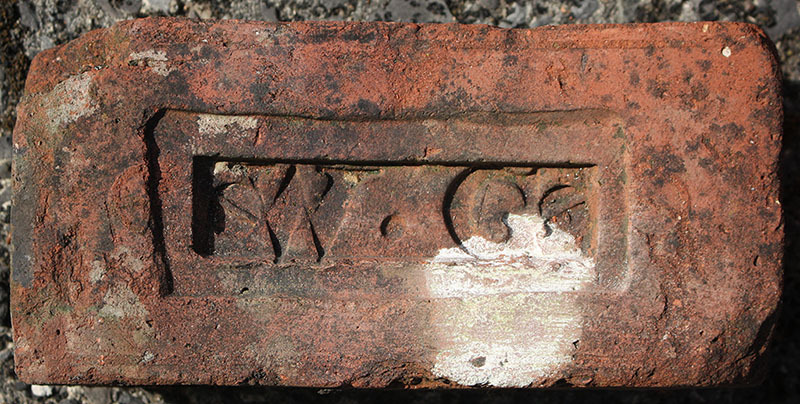 George Grimwood & Sons are listed in Kellys 1892 to 1900 editions at the Brookshall Brick Yard, Norwich Road, Ipswich. Houses built on Sherrington Road & Westholme Road & a park now occupy this former brickworks site. Photo & Info by Martyn Fretwell. 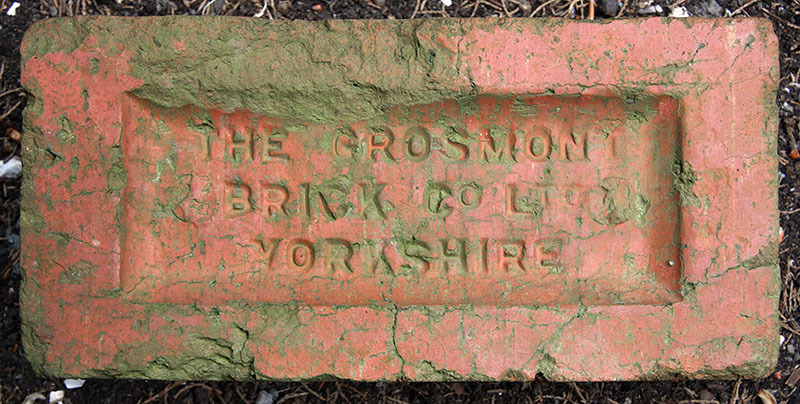 Found by Malcolm Smith on the Camerton Brickworks site near Workington, Cumbria. 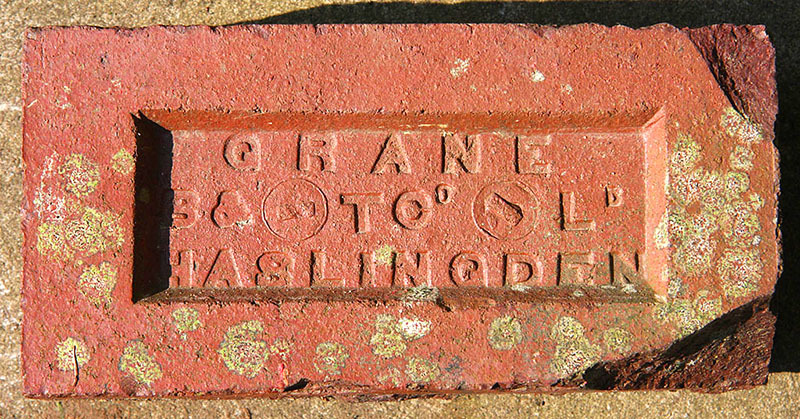 Also refer to the entry for Nottingham Patent Brick Co.
Edward Gripper had established a brickworks in 1855 at Mapperley Top, Nottingham & then in 1867 he was joined by William Burgess, creating the Nottingham Patent Brick Co. This new company used the Hoffman Kiln process which Edward Gripper and his managers had previously negotiated the local use of before Burgess joined the company. 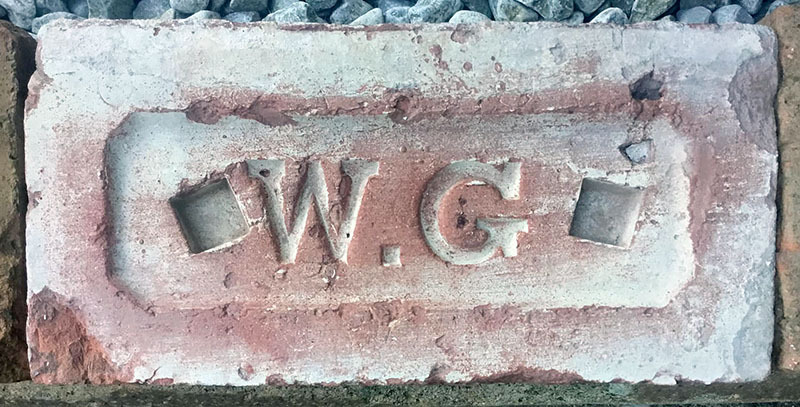 This process substantially increased the companies brick output to 27 million per year and in his honour bricks were produced with Gripper's name on. NPBC went on to produce the millions of facing bricks for St. Pancras Station in London, for which they were the main contractor. Photo & Info by Martyn Fretwell. 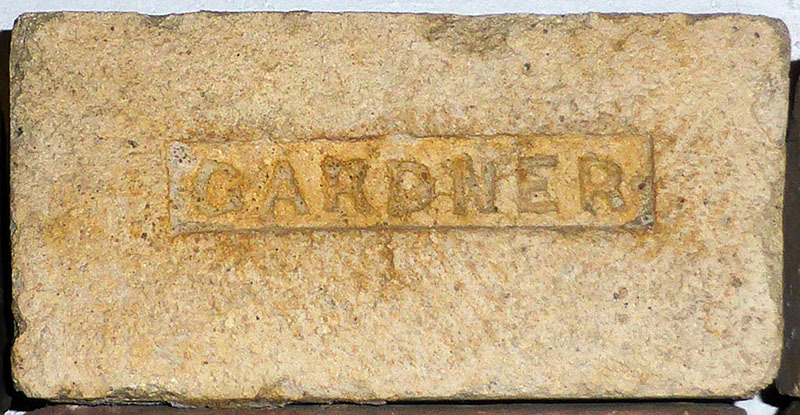 This example of a Gripper brick was made by the Nottingham Patent Brick Co. in recognition of Edward's hard work for the company. The other example shown was produced at Gripper's own works between 1855 & 1867. Info & Photo by Martyn Fretwell. Courtesy of Nottingham City Museums & Galleries. Both found in Whitby by Simon Patterson. Edward Gross, Wix near Manningtree, Essex is listed in Kellys 1906 to 1910 editions & the works was operational between 1905 & 1912. Photo & Info by Martyn Fretwell. 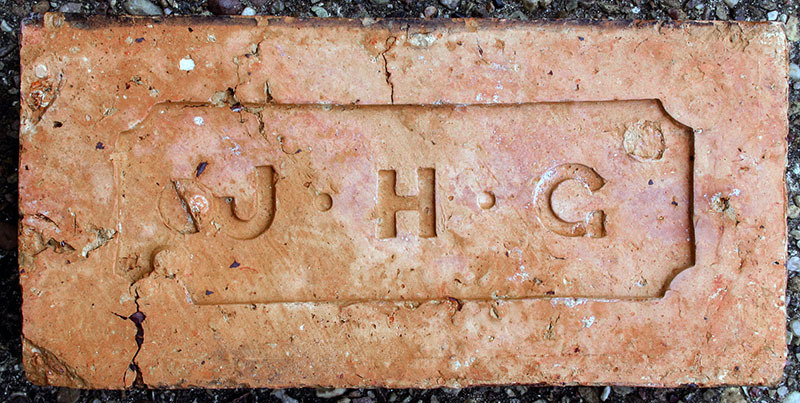 John Grover a Kent builder purchased the Hammer Vale Brickworks, Hampshire around 1900. Both blue clay ( for tiles ) and yellow clay ( for bricks ) was found on this site. His bricks were used to rebuild the slums in East London and such was the demand for his machine made bricks, that when the clay ran out in 1938, production was moved to the Nutbourne Brickworks, Hambledon, Surrey. Photo and info by Martyn Fretwell. Also see the entry for Hammer. Photo by Martyn Fretwell. Edmund Grundy,Larkhill Brickworks,Farnworth, info by Colin Driver. Info & Photographed at Bursledon Brick Museum by Martyn Fretwell. Photo by courtesy of the Frank Lawson collection. This brick and tile works, with an adjacent quarry, was located south of New Scarborough, Guiseley, West Yorks between 1893-1938. Although today the area is recognised as Yeadon brickworks SSSI, in 1938 it was called Guiseley brickworks. I feel quite sure that a single site has had two names. The Yeadon brickworks and quarry were owned by the Marshall family. In a 1908 Kelly's Directory the owners are given as Marshall & Gray Ltd. 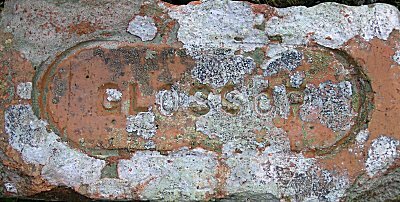 In addition to the [GUISELEY BRICKWORKS] mark that is illustrated above the company also used [M.MARSHALL][GUISELEY] and also [M&G]. Information by Derek Barker. William Gunton is listed in Kelly's 1896 & 1904 editions at Barney, Dereham & then together with his brother George at several works around Norwich in Kelly's 1896 to 1912 editions. Photo & Info by Martyn Fretwell.